I just read this awesome book that seemed to be about my homeschooling life but I didn’t write it! 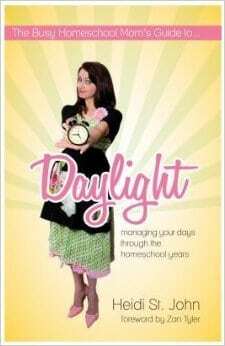 When I was asked to review The Busy Homeschool Mom’s Guide to Daylight by Real Life Press I thought it would be like all the others. You know when they tell you how to be perfect like them. But No! This book was so much different. I could relate to everything Heidi St. John (author) was talking about. For example she talked about homeschooling and schedules, how in the beginning she had this plan of how their homeschooling day would go, from the time they woke up to the time they went to bed. She said it lasted a couple of months. This was so like me, I made a schedule that included all the subjects that CJ would do each day and then I listed chores and bedtime on there. Well like her it only lasted a couple of months, until I realized that you just have to go with the flow and that homeschool doesn’t have to be uniform like public school (ah, the beauty of it all). We don’t have to wake up at 8-9 am and get schooling done, we can school at noon, 6 pm, or even 10 pm depending on how he learns best. She talks about schedules a lot, even shares her own and then features others schedules. But she says not to compare your schedule with anyone else’s, everyone is different. Some people are morning people and can get up at 5 am and start doing everything and some are night owls (me 🙂 ) who can’t get started until 10 am or later. But that’s fine. We know what works best for us. If you are at the end of your homeschool rope, tie a knot and hang on! I’ve been there before, whether CJ wasn’t paying attention or just didn’t want to do the work, it’s hard at times. But you push past it and leave it for another day. Another chapter that spoke to me was about cleaning. How you should split up your home in zones, and then just work on that zone first. Just doing 5 minutes at a time. Include the kids in washing laundry and putting it away, which I do. CJ and AM know how to wash clothes, if only I could get them doing dishes 😉 that would be the trick. I love how she uses encouraging quotes from the bible throughout the book. She has other books like lap books, bible studies, and even a book on romance if you need that. Final Note: I highly recommend this book if you are homeschooling and need suggestions on how to plan your day.